Dandelions – everyone’s favorite weed. They are everywhere, yet no one really wants them around. Dandelions are resilient and can grow in any type of soil, although they do best in full sunlight. Even though you cannot see the dandelions in the fall or winter, the roots are often still there. Getting rid of dandelions is on many lawn-keepers to do list, but not all dandelion removal efforts work effectively. Most people relentlessly dig to get rid of dandelions. But the roots are so long that you are unlikely to capture the entire root and thus it grows up again in the same place. You have to dig deep enough or else you will be out at the same spot before you know it. This method can be quite time consuming depending on how many dandelions have invaded your lawn. It’s also inexact, and may leave large holes in your yard. One of the best defenses against dandelions is a thick, full lawn. If you set your mower to a higher setting so that the grass is not lower than 2 inches, and combine that with healthy thatch, good watering, and overseeding, you can create an environment where the longer blades of grass will block the sunlight, which will in turn prevent the dandelions from growing. Home remedies include boiling water, vinegar, salt, muriatic acid, and even setting rabbits free to roam the yard – the latter sometimes with disastrous results. There are many herbicide products on the market. You will want to ensure you purchase one that is right for your environment and will not harm the grass or any other nearby plants or vegetation. You will also want to make sure that you read and understand the instructions so as to keep you, your family, and any pets safe. Because of the risks and difficulties, and because the presence of dandelions often points to larger lawn problems, most call in an expert. Whatever method you use, you want to make sure you do eliminate the dandelions before the fluffy white seeds appear as these cause the dandelions to multiply and spread. Green Lawn Fertilizing has experience with dandelions in the Pennsylvania, Delaware, and New Jersey regions with time-tested methods for getting rid of dandelion weeds. Give us a call at 888-581-5296 and let us get started on creating a lawn free of those pesky dandelions. These plants are remarkably vigorous, tolerant, and fast growing — too bad they also are unwanted. 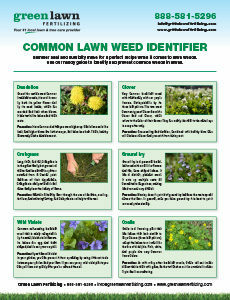 Learn the weeds most familiar to lawns in this area, the conditions that sustain them, and techniques to control them. The thing you might want to mention to your readers is if anyone tries any of your natural remedies they will kill there lawn also. Unlike chemicals, with your natural methods you can ONLY touch the dandelion itself as they are non selective!! I pretty much agree with Matt there, it is quite necessary to use only natural method. Would love to see one post for that.